Upon leaving the beauty of Gros Morne Park, we drove over 400km in pouring rain to reach Twillingate – hoping it would be worth the long trek. This picturesque fishing town is located at one of the most northern tips of Newfoundland and is known for being a whale watching & fishing haven. One of the first attractions we saw when we a crossed the causeway to enter Twillingate was the Prime Berth Interpretative Fishing Centre & Craft Studio (www.primeberth.com). It was hard to miss as it boasts a real live skeleton of a whale on the outside – super cool! Apparently, some years ago, a dead whale floated ashore some 30km from where Captain Dave & his family lived (the whale’s tail was cut off so the locals suspect it got hit by an oil tanker). Dave called up the local government and asked what they were doing with the whale and subsequently received permission to transport it with his boat to a deserted island, where he and his friend Bill let it rot. They then proceeded to take the bones and took months to clean and rebuild the skeleton. They also used other items such as the baleen etc. to put on display at their outdoor fishing museum (a nice educational spot to learn about the fishing trade). Upon entering the interpretative centre, Bill Cooze welcomed us with his stories, big smile and songs, using an “ugly stick”– a locally made, funny musical instrument – that Filou loved and learned to play a bit. After speaking to the charismatic Captain Dave, we decided that he was the guy to provide our fishing enthusiast Emile with his “dream” trip, and so we booked our tour for 1:30 pm the next day (the locals in town recommended him too, as the go-to guy). Dave suggested we park our RV at the old fishing wharf – a deserted, beautiful historic place by the water where we ended up having two wonderful nights of rest. The next morning, we first drove up the hill to see the Lighthouse and the famous “Iceberg Alley” – where we did spot an iceberg – although on the very distant coastline. To fully take in the beauty of this location, we took another gorgeous hike alongside the water, taking in the splendour of the impressive, rocky coast. 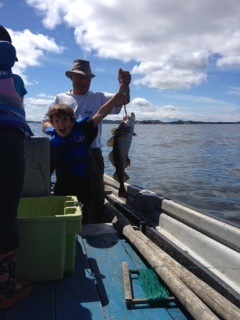 That afternoon, the sunshine gods were with us for our boat tour and Captain Dave and his granddaughter escorted us on board for our fishing adventure – with the promise that Emile would catch the biggest fish he ever had. 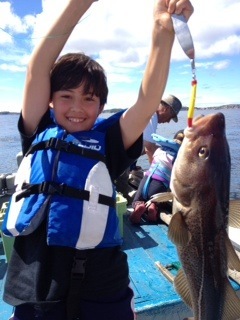 Dave, quickly realized that our boys like a thrill, so he put the boat at full speed – bumping us over high waves towards our “prime berth” – or best fishing spot. We flew so high that once we got completely thrown out of our seats, while splashed by fresh ocean water everywhere. The boys were giddy with laughter and “water girl” had a blast too! Dave, a very skilled fisherman, had all the appropriate tools on board to get us to the best place for a catch, such as a fish finder (little computer that showed us the “fishing hills” under water). Once there, he told Emile and Filou to lower their lines (just a really long line with a massive hook and lure on it) and gently pull the line up and down to entice the fish. 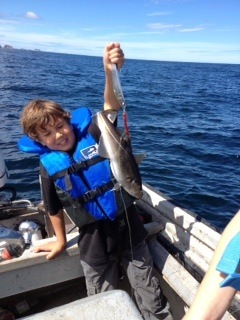 Within less then a minute, Emile caught his first cod fish, and Filou quickly followed. 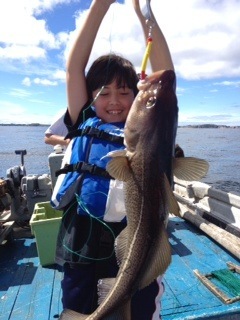 The fish were undoubtedly the biggest the boys ever caught (and might ever catch again!) 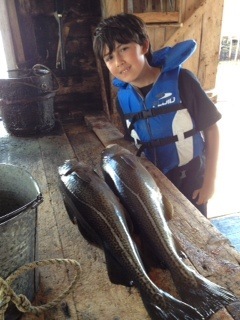 – Emile’s second fish was close to 8 pounds and looked as big as he is. The smile on his face was absolutely priceless! Filou who is usually not as excited about having the sit patiently for a catch, thought that this was the right kind of angling: drop a line and immediately wheel in your fish. However, he had to use all of his strength to get the big fish up and once on deck, make sure that the fish tale didn’t flap him in the face! We kept the two biggest fish for dinner that night and once back on shore, Captain Dave gave the boys a nice show of how the fish are cleaned. Everything was filet-ed, up to the fish cheeks, tongue (a delicacy) and even the eyeballs (that apparently have a little piece in them that the fishermen chew like gum!). What a show! Captain Dave’s wife was so kind to pack up the cleaned fish for us (even gave us some flower for cooking), and that night we drove to “Little Harbour” a beautiful spot by the ocean, where we chatted with the creative locals (many of whom make beautiful boat models & paint the most gorgeous naval sceneries) and ate the freshest, most delicious fish we ever tasted! 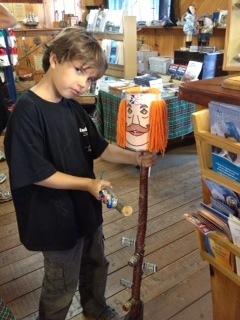 Certainly enjoyed your blog on Twillingate and your visit with us. Thanks for all the nice comments. Hi boys. Keep smiling…too bad you don’t have an ugly stick to drive Mom and Dad crazy. Thanks Bill! You make the visit but fun and educational. We were delighted to have chosen you for our visit and boat trip. You and Capt. 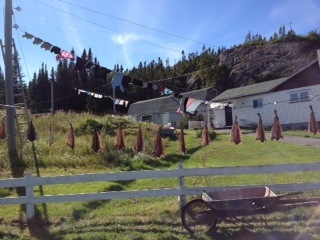 Dave run a wonderful operation and I happily recommend it to anyone visiting Twillingate. Hope you get to follow us around the world….Stay in touch! We will Capt. Dave! Did I tell you, you remind me of my Dad? So full of life – Keep Smiling and Carpe Diem or Y.O.L.O!